Having a great sound system in your backyard or other outdoor area can make for enjoyable parties and events, but it can also spice up mundane activities like mowing the lawn. Whether you are looking to have your next huge block party, bring fun music along on a camping trip, or simply want to do some gardening to the sound of tranquil music, this review will take a look at the best outdoor speakers that are available. Yamaha makes some of the best outdoor speakers available and you will see a few different models in this review because of their quality and price. 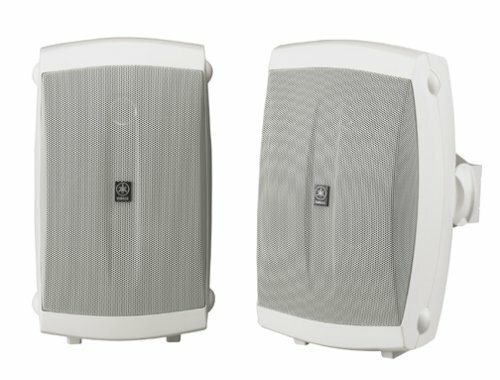 The NS-AW150W 2-Way Outdoor Speakers are incredible considering the price that you pay for them. 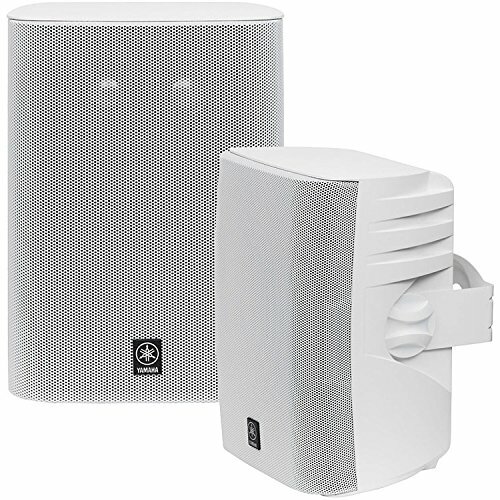 For under $100, you will get these two speakers that offer 120 watts of maximum output and as well as mounting hardware that allows you to put these anywhere in your backyard. Furthermore, the mica-filled woofer and PEI dome tweeter are magnetically shielded to resist water damage. The Yamaha quality that you get for such an inexpensive price really makes this a great buy. You can go up a step to the NS-AW350W model, which are slightly larger and have a greater power capacity, but otherwise essentially the same as the 150′s. One downside of the NS-AW150W is that it does not come with speaker wire. For someone who doesn’t know this in advance, it could be frustrating when they unwrap your new speakers only to realize they need separate cabling to hook it all up. However, if you plan in advance, you can also purchase speaker wire and have everything ready to go and set up. And, with the inexpensive price of the speakers, even the added expense of speaker wire still makes the total purchase less than other speaker options. As a matter of fact, you could even get two sets of these speakers for added listening distance, and come in around the same price as speakers that are offered by other brands. Another great option for outdoor speakers is the Polk Audio Atrium 4 Speakers. 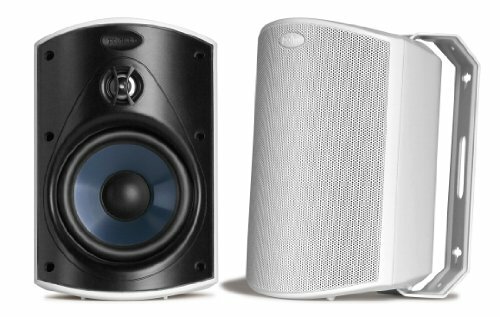 If you can find these speakers for that price, we suggest you grab yourself a pair because of how much value you will get for that price. These speakers are a little bit bigger than other outdoor speakers that you may find. However, the design of the bracket on this product makes it extremely convenient and easy to put these pretty much anywhere. his is perfect for parties when you want to be able to hear your music, even through the crowd of guests you may have. Unfortunately the Atrium 4 also does not come with speaker wires included, so you will want to plan ahead and purchase some on your own. If you have a more substantial budget, one of the best routes you can go is the Yamaha NS-AW570. These are some of the best on the market. They are more expensive than the popular conventional choices, but you’ll definitely get for what you pay for. These speakers are arguably the best value per dollar spent. Unlike other speaker systems available, the NS-AW570 comes with a dual-tweeter system. This configuration allows the system to play higher frequencies, which relates to less interference with the sound waves of the woofer. To sound aficionados, this presumably all makes sense. But if you are not as familiar with all this technical talk, you will certainly notice the difference in sound once you hook up a system that has better tweeter arrangement and better sound. Like other Yamaha brands, the NS-AWS570 is designed to be placed outdoors, so you can expect the same quality and protection against weather damage as with other Yamaha products. With its superior sound and system configuration, the Yamaha NS-AW570 is certainly a top of the line option. And if you’re willing to spend a little more, it is one of the best routes you can take for your outdoor speaker setup. The aforementioned three products that we have listed are all great choices for outdoor speaker systems. However, they all look exactly like speakers that you would expect to see inside your home hooked up to an entertainment center in your living room. Moreover, they require physical cabling to power, which can be a pain if you plan to move your speakers around often. In Contrast, The AWS53 and AW825 are two options that are quality speakers that can be battery powered, and are designed to look somewhat like lanterns, which you might find to blend better in an outdoor patio set up. If you’re looking for a great outdoor speaker system to go camping with when an outlet is not available, each of these is a great choice. Moreover, both of these speakers also come with a transmitter that can be linked to other speakers throughout your house via your iphone, ipad, adroid, or other wireless device. This is a great feature to have when syncing all the music in your house during parties or events. Both of these Acoustic Research options are priced around the same and give off the same quality output. The difference is minimal internally, however they do differentiate by coming in different colors, which is nice when looking to accentuate your backyard. Although the sound may not be as great as the Yamaha NS-AWS570, you are trading quality for convenience and price. And with either of these options, you will most certainly get convenience and a great price. Outdoor speakers have allowed us to take our audio to a different level and expand our entertainment space. The options mentioned in this review are some of the best outdoor speakers available. You can be sure to throw some great parties with music and audio that all of your friends will remember and have them asking you when your next big event will be.